I went down to Congregation Rodelph Shalom at 10 p.m. to meet a group of volunteers counting the homeless in a program called Point-in-Time Count. PIT is federally required in order to have an understanding of the number of homeless people in a given area so that governments can use the data to allocate funds. In 2014, 5,738 homeless people were counted in Philadelphia according to a PIT press release. Despite the high figure, it's not often Penn students stop to acknowledge it. At 11:30 p.m., I set out with eight other volunteers into the West Philadelphia area. Other groups canvassed different parts of the city. We rode in a van with volunteers Stanley Crawley — a member of Philadelphia Access Center who led the team — Senaka Peter and Kim Wilson. Our first stop was at Fairmount Park on MLK Drive. As we drove, Crawley, a former homeless and mentally ill drug addict who now devotes his time to community outreach, shared his experiences with us. Wilson, a mother of eight kids, seven of which are adopted, was motivated to participate in the event because two of her children were homeless before she adopted them back in Cincinatti. Although Peter does not have any personal experience with homelessness, she said "it's something I confront everyday walking right outside my door to the train.” A Philadelphia resident originally from New York, Peter decided to volunteer for the PIT as a way to give back to the city she lives in. “Your eyes are open in a different way toward the city” after a count, she said. We stopped around midnight, and Crawley exited the car and checked in with a man that him and Brooke Crowley, also of PAC, are familiar with and referred to as “Spider.” This man lives by the river in a shelter he's made for himself inside a tree trunk, furnished with a wooden floor. We tallied him as our first homeless encounter of the night. After leaving MLK Drive, we drove around various parts of West Philly checking in at locations that Crawley described as “hot spots” for homeless activity, but we did not see anything. We arrived at the VA Medical Center at 1:02 a.m., where we encountered seven men staying inside the emergency room. 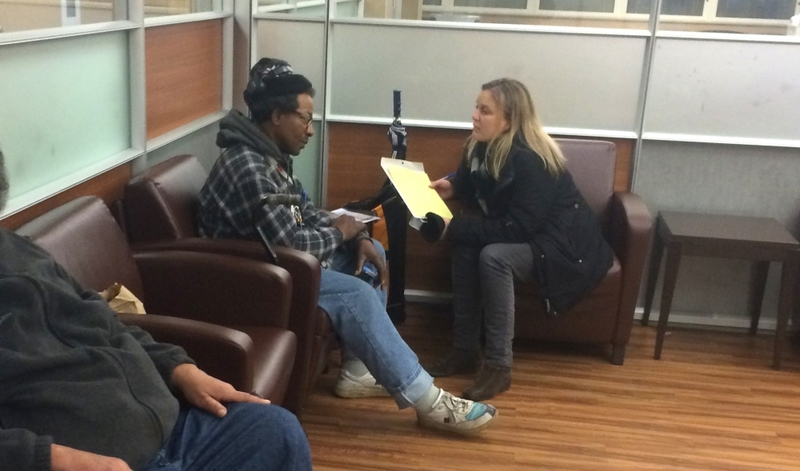 Two of the men participated in a survey about their housing situations, mental health and relationships with others. As we were leaving, a police officer asked the men lying down on benches in the lobby to sit up. Crawley told the group that a new director at the VA Center has been much stricter with allowing these men to stay overnight. Around 1:45 a.m., we took on the hot spots where Penn students might be used to seeing some homeless people such as Wawa on 38th and Spruce, and McDonalds and FroGro at 40th and Walnut. We tallied a homeless man at 38th and Walnut and saw three men taking refuge from the cold in McDonalds. An administrator from the U.S. Department of Housing and Urban Development praised Philadelphia's PIT earlier in the night. “Philly does an outstanding job of organizing the count and paying attention to it,” HUD Region III Administrator Jane Vincent said. Vincent and other administrators plan to use the count as a benchmark to help reach national goals of ending veteran, chronic and all homelessness within the next several years. The count allows officials to “gain a better understanding to create programs to put them in their places,” Vincent said. He praised Philadelphia Mayor Michael Nutter for being one of about 40 mayors nationwide to participate in the Mayor Challenge sponsored by HUD, which creates partnerships between city and federal governments for better funding to combat homelessness in urban areas. At 2 a.m., I left the group and made my way back to the Quad, eager to return to the warmth and shelter of my dorm room. By PATRICK ZANCOLLI ・ 01/23/15 10:00am. Return to Asylums? Let’s Not!